The first thing to notice when viewing the low light test scene at ISO 200 is that the GX7 has a slight yellow cast, though it's not as pronounced as on the Olympus OM-D EM-5, which preserves warm tones by default. By the time we reach ISO 800, fine detail and low contrast areas are starting to get smudged. 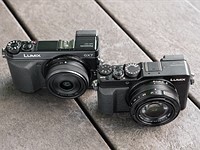 At ISO 3200, the GX7 doesn't hold onto quite as much detail as the E-M5, and is just a bit better than the NEX-6 and D7100. 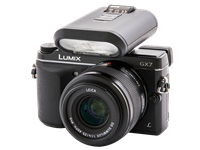 While the GX7 still has a fair mount of detail left at ISO 12800, those photos are best suited for web viewing. As you'd expect, Raw images are noisier than their JPEG counterparts, as no noise reduction is being applied (by the camera or ACR). When you reach ISO 800, you'll see that details are starting to fade away compared to ISO 400. 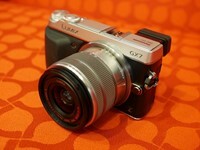 Even so, the GX7 holds its own against the OM-D E-M5, NEX-6, and D7100. While chroma noise is visible at ISO 3200, its becomes quite pronounced one stop higher. If you flip through the DMC-GX7's peers at higher sensitivities, you'll see that they all perform fairly similarly in terms of color noise.